When I think the Wild West, the first thing that pops into my mind is, of course, cell phones. Visions of cowboys riding the trail for hours, playing Candy Crush and hitting crazy high scores. Sitting around the campfire, roasting a vermin they found nearby and checking their Instagram to see how many likes they got on that picture of a cactus with the sun setting just behind it. Setting their alarm and queueing up their sleeping playlist of Rhinestone Cowboy on infinite loop as they curl up with a rock and drift off to sleep. Did I mention that I don’t really understand the old West all that well? 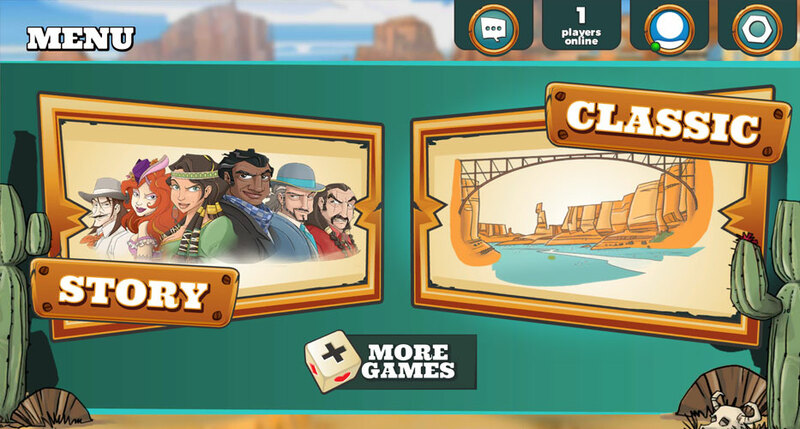 While this might all sound like nonsense, there is one interaction of the Wild West and modern technology that you can get your hands on, and that is the app version of Colt Express. The original CE is a programming game with incredible components that we have reviewed before and really enjoyed. I personally picked up a copy a few months ago and it has quickly become one of my favorites that I try to introduce to people as often as possible. The fantastic components – especially the train cars – hooked me quickly, and the frustrating yet hilarious interactions with other players left me coming back for more. When I first picked up the app, I worried that some of that magic might be lost in a digital translation. Now that I’ve played a few rounds, I can tell you that the digital version has some great parts, but may not be for everyone. 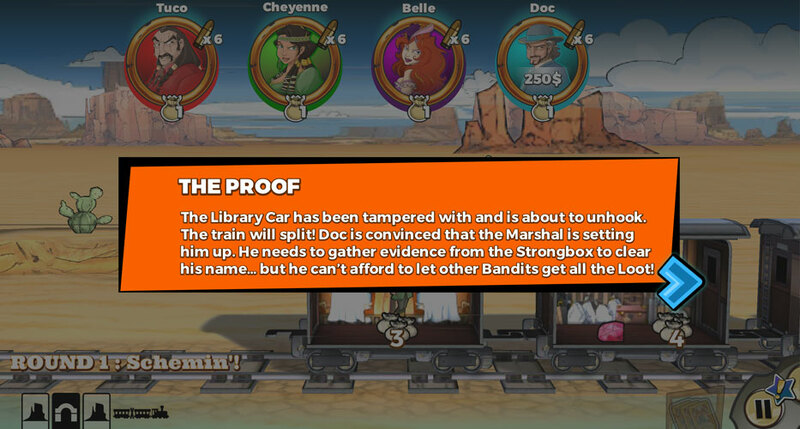 Before we begin, I want to give you a quick recap on the mechanics of Colt Express. You and the other players are a bunch of outlaws who are all choosing to rob a train – it just so happens that all of you have chosen the exact same train at the exact same time. Let’s divide and conquer, people! The game is played over five rounds, in which players take turns playing action cards into a stack – sometimes in secret, sometimes where everyone can see. However, it’s not until everyone has played all of their cards for the rounds that these actions take place. Thus, you have to keep in mind what the other players are going to do and try to determine how best to respond to those actions in order to pick up loot, shoot your opponents, or avoid the marshal. As you go through the deck of cards at the end of the round, players can choose where they move, who they shoot, and which loot they pick up. But, they must do the actions for the cards that they played, even if they are to their detriment. This takes place over five rounds, and at the end of the game whoever has the most money wins! In my opinion, the digital version starts off behind from the get-go, as it lacks the awesome components of the original game. I love the train cars and other cardboard decorations of Colt Express – I mean, they even include pieces that are completely unnecessary just to give it more theme! With just a screen, it’s hard for that wonderful part of the game to come across, but the creators sure have tried. The art on this game is quite good. Even from the menus, you can see that a lot of effort has been put in. There are also some great details as you play the game that add to the experience. While you’re going about the robbery, great pieces of Western scenery are passing by in the background. Whenever you go into a tunnel (thus allowing you to play cards face down), you actually go into a tunnel! This detail also carries over as the action begins. Your characters will move from car to car, shooting each other and picking up loot very smoothly. This actually looks like a game that was built for your phone, and while that may sound like silly praise, that doesn’t always happen in an app based on a board game. The game comes with two modes – story and classic. Classic works just like the board game, where you can play against some AI or online opponents to be the best thief. The game sadly doesn’t support local multiplayer, which is very disappointing. I feel like having a game like this that you could pass around from player to player on a long road trip or something would be fantastic, but alas that is not to be. I also am not sure how good the online multiplayer is because there were never any other players there. But maybe it’s awesome? Perhaps the programmers didn’t have time to work on local multiplayer because of all the work that they put into the story mode. In this setup, you are given a set of circumstances that change how you play the game. For instance, one round had me stealing the safe box and preventing the other robbers from acquiring $2000 worth of loot, all while train cars break off each round. 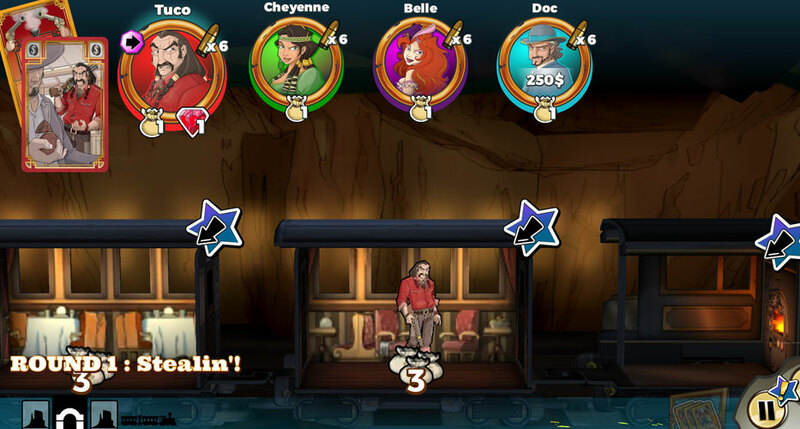 All six characters have their own set of six missions, so you’ll find yourself with plenty to do once you’ve downloaded the app. On top of all of this, beating all of the missions for a character will unlock variants back in the classic game. Oddly enough, playing this game made me appreciate more the things that I love about the board game. The components are truly tremendous, and they are sorely missed here. The personal interactions with players are essential, and this app really suffers from a lack of a pass-and-play option. So if you’re looking for just a re-creation of the board game, you’ll probably be disappointed. That being said, I have begun to see the bright spots of the app for their own merit. The developers have really put a lot of time into the story mode, and it comes off as a really solid game for mobile play. And to be fair, there’s nothing about Colt Express that’s portable, so if you’re able to get a bunch of friends and somehow play an online version, then maybe this will satisfy that need. So, if you love the theme and mechanics of this game and are looking to get a new addition to your portable gaming library, maybe give Colt Express a shot. It’s not going to bring the same magic of those little cardboard trains, but it might tickle your fancy in some other way. 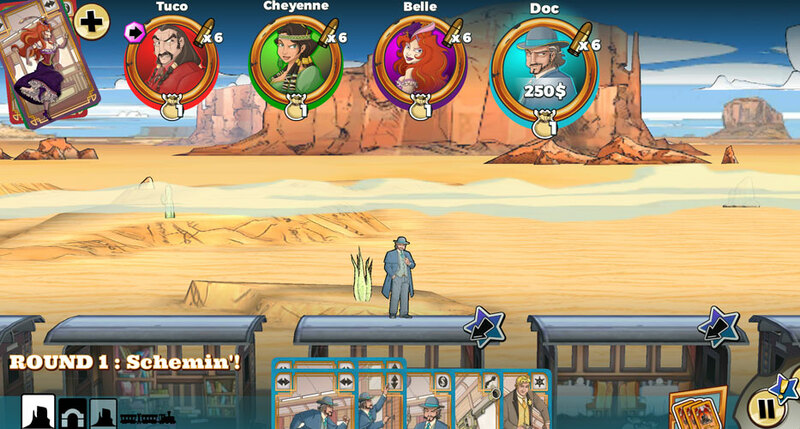 You can download Colt Express for iOS or Android.